I received this book via the owl crate, as you probably know if you read my blog. 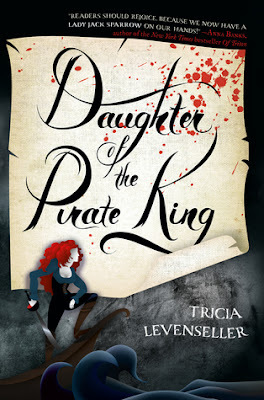 I was so excited to finally have a book about pirates that I started it right away! I love Pirates of the Caribeans and the box promised us a story that every lovers of this movies will love. And I loved it! The book have a good fluidity, the action pass rapidly, in a blink of a eye we are at the end of the book and we don't get bored at any time during the story. I particularly loved the character of Alosa, who is a strong female main character. She's independent and she's able to save herself from tough situations without help. She put spells on mens, making them do what she wants. She manipulate them to obtain what she wants. I also loved the character of Riden, because he's the kind of man I like. Romantic, ready to do everything for the loved one. But mysterious at the same time. There's a good chemistry between Riden and Alosa and during all the book I was hoping for them to get together.... well I'll have to wait for the next book because sadly it doesn't happen in this one. The next book will be out in February 2018.